San Francisco pays tribute to iconic crooner and SF ambassador Tony Bennett with a public unveiling of Tony Bennett Way, the renamed 900 block of Mason Street in front of the historic Fairmont Hotel where Bennett first sang his famous homage to the city, I Left My Heart in San Francisco, in 1961. John Murray Productions was honored to work with e2k to provide the scenic environment for this historic event, which included a main stage featuring a large printed backdrop, custom drapery treatment, and street sign prop, as well as a custom accessibility ramp so all visitors could make their way to the bronze Tony Bennett statue for a photo op. The look was elegant & classic, fitting of the 91 year old singer so beloved by the City. Additionally, the event highlighted world class entertainment, including a Tony Bennett impersonator that rappelled the hotel facade to kick off the ceremony. Click here for a fantastic video overview of the unveiling. JMP is now a ModTruss dealer. 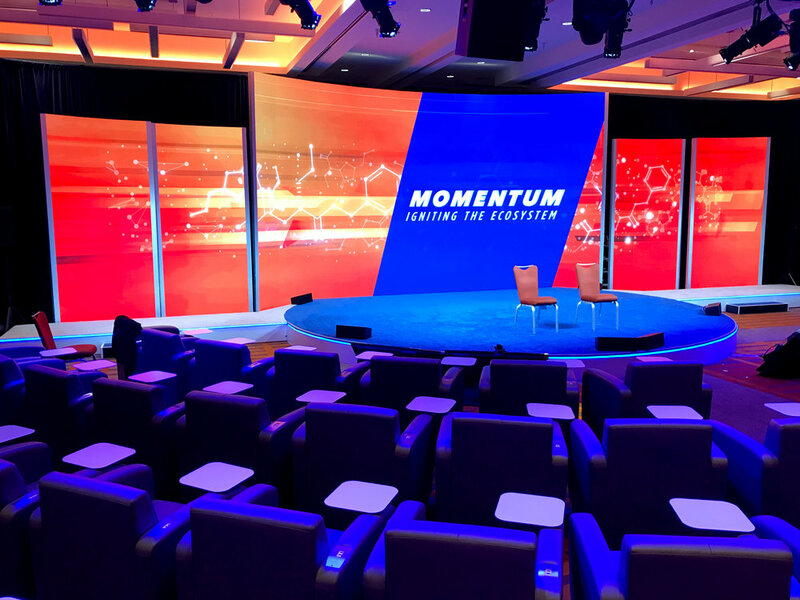 When John was introduced to the ModTruss booth at a recent LDI Convention, he knew this award winning product could provide countless solutions to the structural challenges that we often face when Creating Entertaining Environments for our clients. 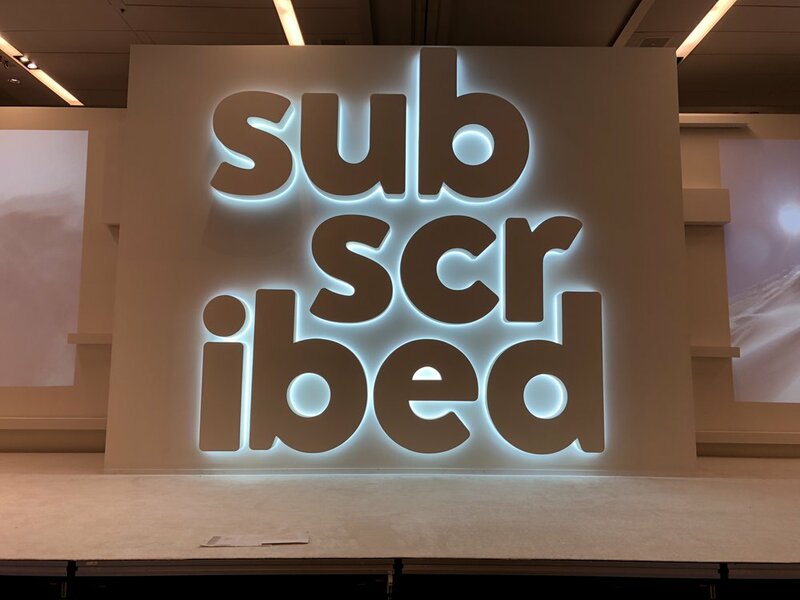 We are believers in this innovative new product and recently invested in quite a bit of inventory to add to our rental stock of customizable sets. Additionally, we are authorized dealers of this product. How can we incorporate this flexible and structural product in your next entertaining environment? The possibilities are endless! We used ModTruss extensively on the Levi's Lot activation at Super Bowl City and found it to be very popular with other vendors as well. Since the Super Bowl, we have used ModTruss behind the scenes for many projects where a robust yet modular structure was required to support our scenery. 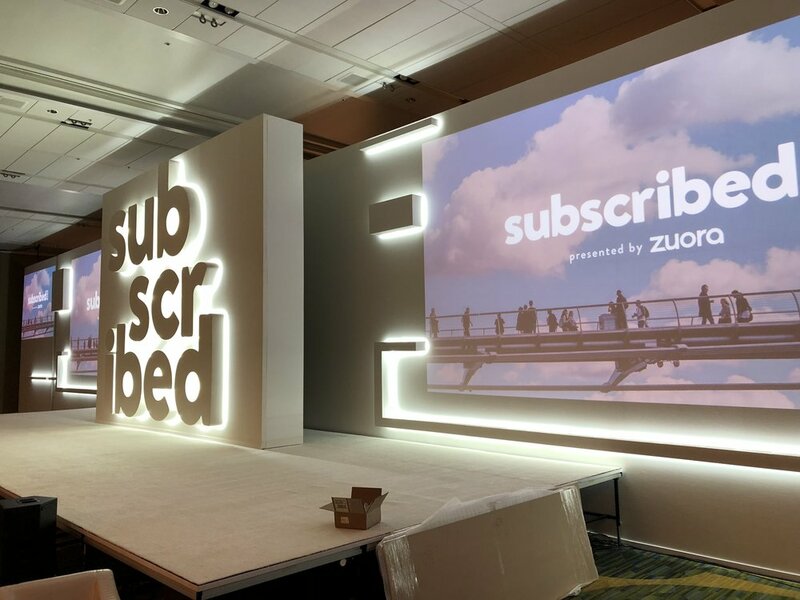 We have even used it as an on stage scenic element as show in this Cloud Foundry event where the industrial quality added the perfect element to this set design. Click here to visit the ModTruss website and learn more about the product. 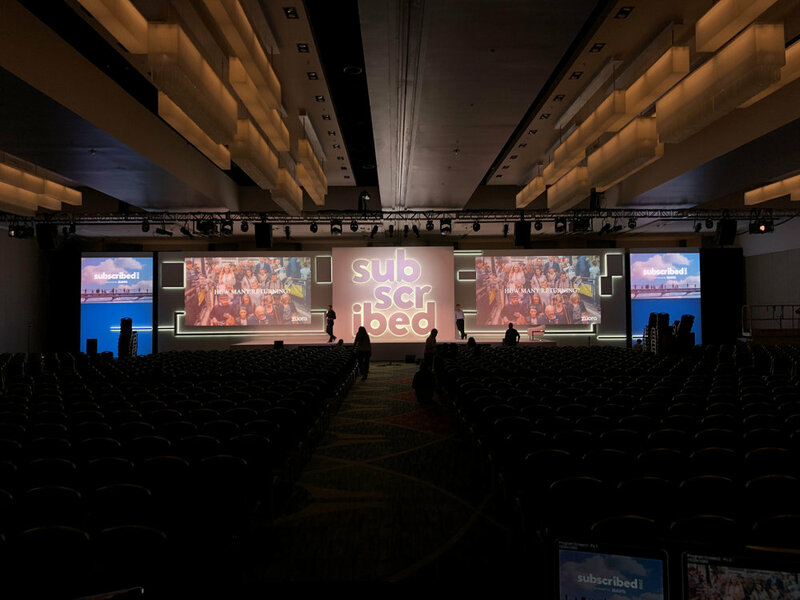 We were recently approached by the good people at INVNT to provide scenic services for the SpringOne conference at Moscone Center in San Francisco. 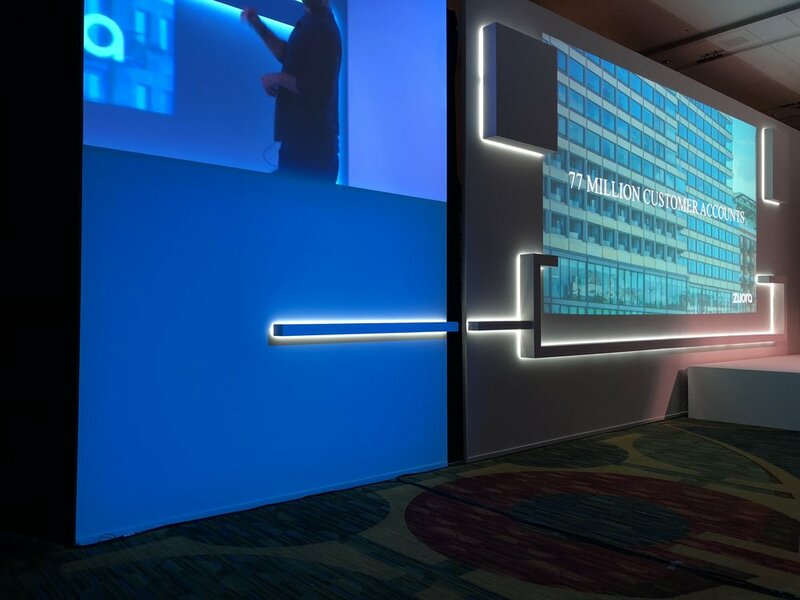 The designers took a minimalist approach where the primary feature was a giant halo illuminated sign with smaller individually lit letters that needed to have color changing ability from the lighting console. 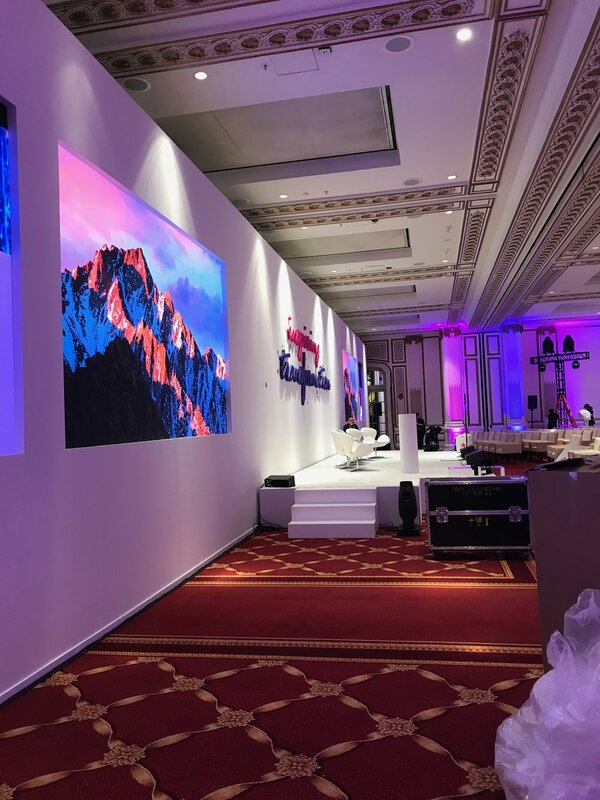 Two 45' wide borderless projection screens floating in front of 65' wide cycs provided plenty of space for great eye candy, and the light changing capabilities of the entire set made for a dynamic look that used color to influence the look and feel of the environment. Chad Wallace of Experiential Marketing Partners had been referred to us by our good friends at MKTG when he needed some help with rebranding a Peet's Coffee trailer that was past its prime. 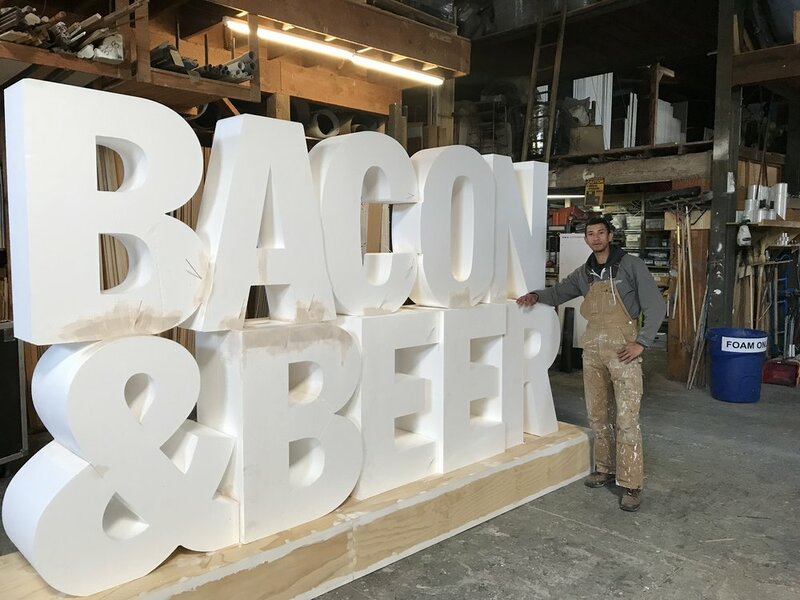 The trailer had been on the road for a couple years, moving from event to event, and its last home was an extended stay next to AT&T Park in San Francisco where it got a daily bath of salty fog. Chad needed to refinish the trailer before moving to its new home on the UC Berkeley campus. See the story of University Partnership Program Welcoming Peet's. Rolling stock is not necessarily our stock-in-trade so we were at first hesitant to take the job. However, our motto is "Creating Entertaining Environments" and we agreed that a hip little coffee trailer on our local college campus fit the bill. As it turned out, the trailer needed more that just updated branding, it needed a full renovation inside and out. We stripped it down to the bones, and began her transformation. 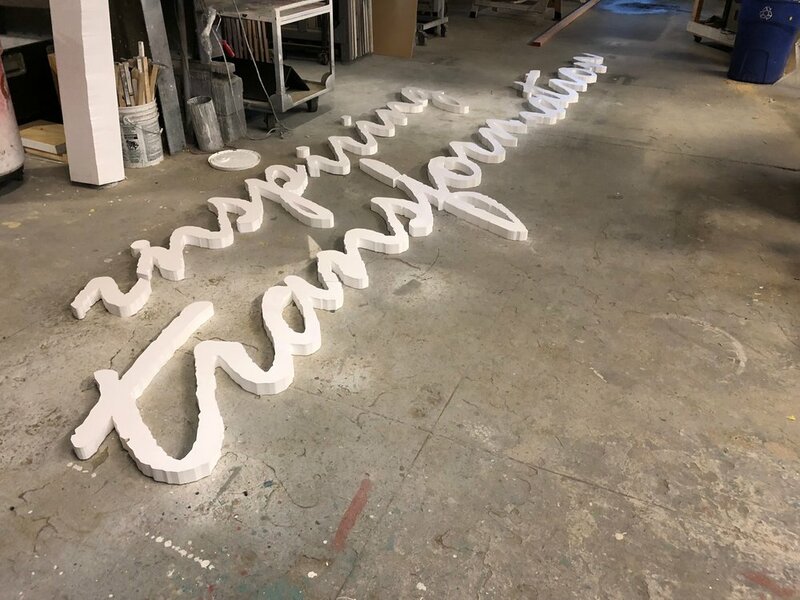 Click through the gallery below to see our process. The exterior wood paneling was in bad shape and needed to be replaced entirely. We replaced the old paneling with a beautiful product from Viridian Reclaimed Wood called Jakarta Rustic. This wood came to the U.S. as crates for steel railroad tracks and was salvaged and re milled by the good folks at Viridian. It’s nice to see the wood get a new life! She’s all dressed up and ready for her debut!